Disconnect the stop light switch connector. 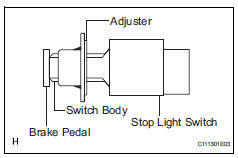 disconnect the brake pedal load sensing switch connector. 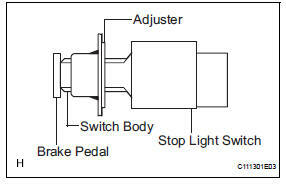 Turn the switch counterclockwise and remove it. Remove the clip from the push rod pin. Remove the push rod pin from the push rod clevis. 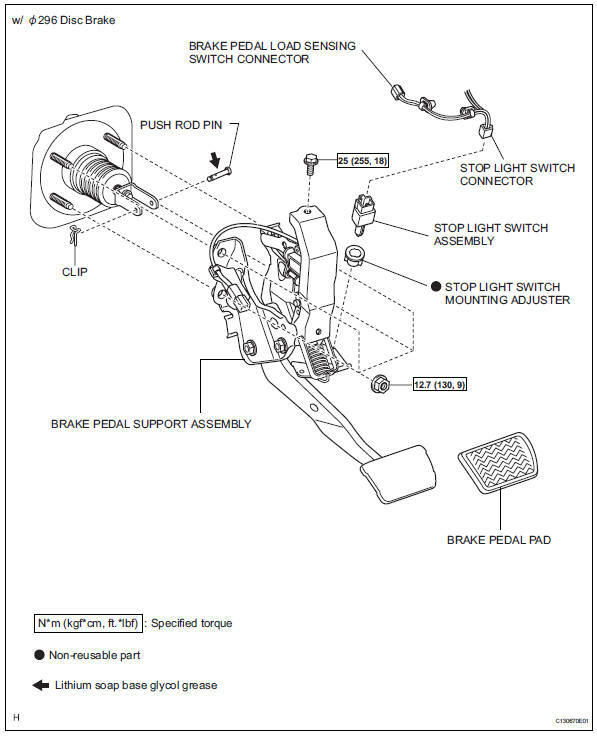 Remove the bolt from the support. Remove the 4 nuts and support. Disconnect the connector from the stop light switch. 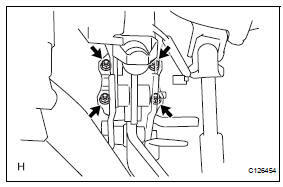 Loosen the push rod clevis lock nut. Adjust the pedal height by turning the push rod. 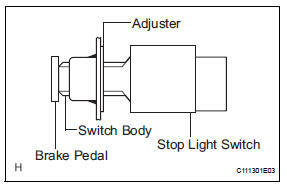 Insert the switch into the adjuster until the switch body touches the pedal. Do not depress the pedal. Turn the switch a quarter turn clockwise. 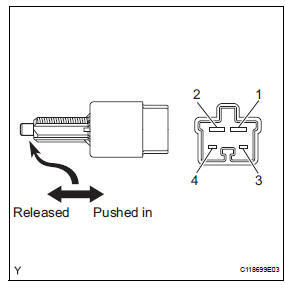 Connect the connector to the switch. Stop the engine. Depress the pedal several times until there is no vacuum in the booster. 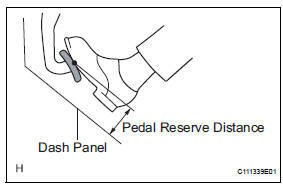 Then release the pedal. Depress the pedal until resistance is felt. Check the pedal's free play by measuring the distance between the position in the previous step and the pedal's released position. If the free play is not as specified, check the switch clearance in the next step. If the free play is as specified, proceed to the "check brake pedal reserve distance" procedure. 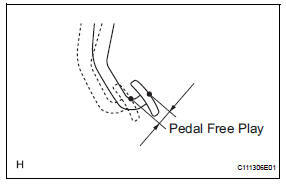 If the clearance is not as specified, reinstall the switch and recheck the pedal's free play. If the clearance is as specified, troubleshoot the brake system and proceed to the "check brake pedal reserve distance" procedure. Release the parking brake lever. Start the engine. Depress the pedal and check the pedal reserve distance. 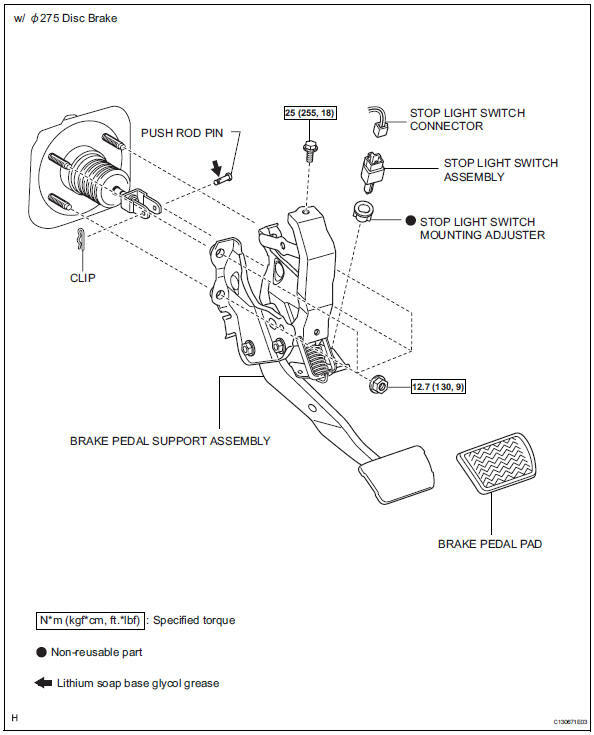 If the distance is not as specified, troubleshoot the brake system. 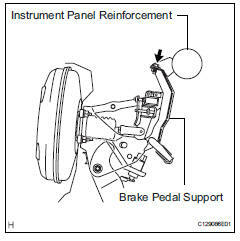 Depress the pedal with a force of 490 n (50 kgf, 110 lbf). 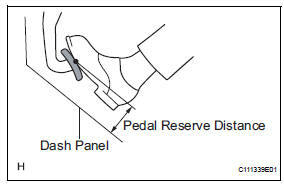 Measure the distance between the pedal and dash panel shown in the illustration. 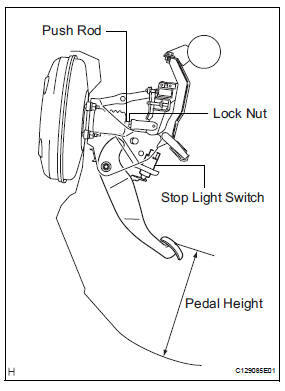 Install the pad to the pedal. 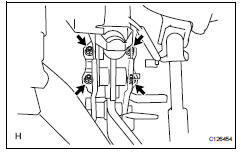 Install a new adjuster to the support. Install the support with the 4 nuts. Install the bolt to the support. 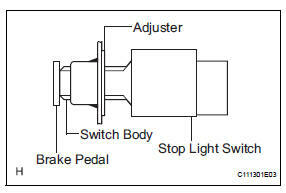 Connect the brake pedal load sensing switch connector. 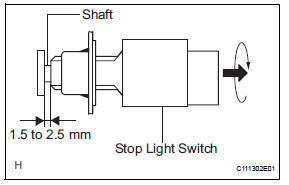 Connect the stop light switch connector.